Jack Holder in action against Coventry Bees. Jack Holder has gone from one extreme to the other by joining Panthers. The club’s new number one spent the last two seasons at Plymouth, operating on what was the tightest track in the second tier of the sport. 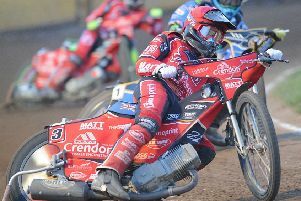 But, after honing his craft on tiny St Boniface Arena, which measures just 207m, he can’t wait to be unleashed on the super-fast and super-sized East of England Showground in 2017. “I don’t really like the tight and technical tracks, but I thought it was good for my career to do a couple of years at a place like that,” admitted Holder, who turns 21 today (Thursday). “It was a pretty tough time for Plymouth and it was sad to see them drop out of the league at the end of last season, but the two years there were good for me. “It’s made a lot sharper out of the starts and really improved my control of the bike. “I’ve loved coming to Peterborough as an away rider and I can’t wait to ride the track on a regular basis. “It’s an honour to start the season at number one and I believe we have a good team here. By his own admission Holder has some ‘big boots to fill’. He is the younger brother of 2012 world champion, Chris Holder, who has unsurprisingly been a big influence on his career. “I guess there are good and bad parts to having an older brother who is one of the best around,” added Holder. “I can’t thank Chris enough for what he has done for me. He helps me massively and that’s great for someone like me who is trying to make it in the sport. “The downside is probably that people will always try to compare us, but he’s Chris, I’m Jack and I just focus on doing my own thing. Holder is already proving himself to be a fine prospect in his own right. He was agonisingly pipped to a bronze medal in the World Under 21 Championship last season. Trying to better that fourth place is one of his main goals for 2017 with a second-placed finish in the Australian Under 21 Championship during the winter securing his return ticket to the world event. “I was really disappointed to miss out on the medal at the time,” reflected Holder. “But when I went back to Australia and thought about it, it shows I’ve mage good progress in a pretty short space of time. “The main thing was qualifying again this year and finishing second in the Under 21s back home meant I did that. “I wasn’t always at my best back home and the senior championship could definitely have gone a bit better.